Brandon Jacobs, 20 years old, was a grocery store cashier and pricing clerk before completing the Right Skills Now program at South Central College in Faribault, MN. He thought machining would be an interesting job. Looks like he’s enjoying his work as a CNC machinist. The point of Right Skills Now was to find a way to match math qualified people with training to get them prepared for entry level CNC operator positions in our industry. After 16 weeks of classroom and hands on machining, Right Skills Now participants get real experience with sponsoring employers. Brandon shows his coach Shawn Olson that his part is in spec. Right Skills Now made it possible for Brandon to try his hand at becoming a machinist. Right Skills Now doesn’t claim to turn people into journeymen machinists overnight. 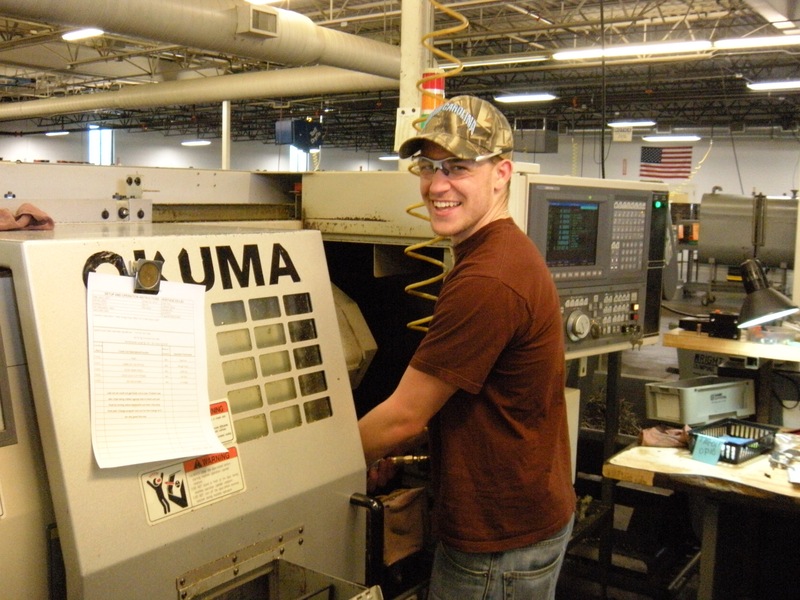 But in 16 weeks, folks like Brandon are mastering the basics of safe CNC operation and are already helping to produce precision machined products for a wide range of industries. Unemployed? Underemployed? Consider getting the RIGHT SKILLS NOW South Central, Dunwoody. Right Skills Now can means Right People Now for your shop. This entry was posted on Wednesday, May 16th, 2012 at 3:57 pm and is filed under Front Office. You can follow any responses to this entry through the RSS 2.0 feed. You can leave a response, or trackback from your own site. Is there a plan to bring this to Southwest Ohio?